Congratulations! Your business leaders recognize how essential your employee development efforts are to ensuring business success. This may be surprising, especially if your budget was recently cut, but the reality is organizations possess one competitive advantage: developing and leveraging the knowledge available to deliver differentiated value. Leveraging this knowledge advantage is, however, somewhat more involved. Current business environments are more complex than simply upskilling employees to meet new challenges. Learning professionals must make their efforts precise and relevant to deliver real value. Business leaders expect learning efforts to contribute toward achieving definitive business results, or more specifically, improving business performance. Achieving business results through learning solutions is challenging since it’s never about delivering direct value. Your efforts must manage a business menagerie of unforeseen risks, continuous change, and attain related performance expectations. This reality is compounded over time as business environments become increasingly competitive. Why should L&D pay attention? The need for “knowledge” is at the top of every business leader’s list of priorities and its role is only growing. The L&D role is no longer relegated to job skills development and compliance. Leaders expect learning’s role to contribute to mitigating risk and managing change, while ensuring improving performance. This is L&Ds time to shine and live up to expectations. Business leaders expect to facilitate these new realities by being more informed, acquiring timely and relevant knowledge. Simply, they must learn what they need to know, when they need to know it and as quickly as possible. Change and risk are close relatives providing for value-focused learning opportunities as both ultimately impact performance. The need for “knowledge” is at the top of every business leader’s list of priorities. To make it more practical and relevant, business leaders consider learning as organizational knowledge. This involves people, culture and infrastructure. Incidentally, these are the same elements learning professionals must incorporate into their training initiatives. Business leaders expect learning to focus on performance outcomes and not learning effectiveness. The learning is the process to achieving well-defined performance expectations, ultimately contributing to reducing risk and facilitating change. Learning professionals must maintain perspective. Even though their role is growing for decision-makers, it is only one of many means to an end. Accountability for performance improvement doesn’t solely rest on learning professionals, but rather, being one element for a complete performance-focused solution. The disparity between L&D and business leaders is wide and each may as well be speaking a foreign language. Learning professionals must be able to communicate their efforts and actions in a business literate capacity. Ultimately, L&D is a business function within a business expecting it to deliver business results. And the common denominator is performance. The first step is to discover how your organization functions and, subsequently, where it derives and drives business value. The first part of this statement provides process context and the second part identifies precise areas to deliver significant learning impact. In both instances, the first step is discovering the series of primary business activities flowing precisely to deliver value to the customer. This systematic business process is known as a “value chain” (see Figure 1), differentiating business processes as primary and supporting activities. Essentially, it provides clarity for core business activities that organizations must execute to derive strategic value and determine overall profitability. The value chain is about uncovering efficiencies within internal processes without hampering business effectiveness. This is a strategic opportunity. Within each primary value activity involves relevant operational connections leading to explicit strategic objectives. It is among these activities and interdependencies where learning opportunities occur to deliver sustainable business value. In this context, the learning support opportunities are very apparent. 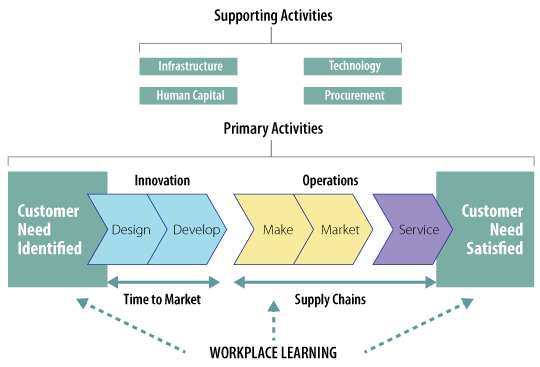 The value chain’s support activities, the learning function in this case, exist to enable primary business activities (see Figure 1). Don’t let this categorization fool you. Learning is central to facilitating operational processes. Leading organizations tend to focus more on support activities, especially learning, to derive differentiated value within the operational processes. Even so, many learning professionals continue to act passively waiting for operational managers to approach them for specific employee concerns. 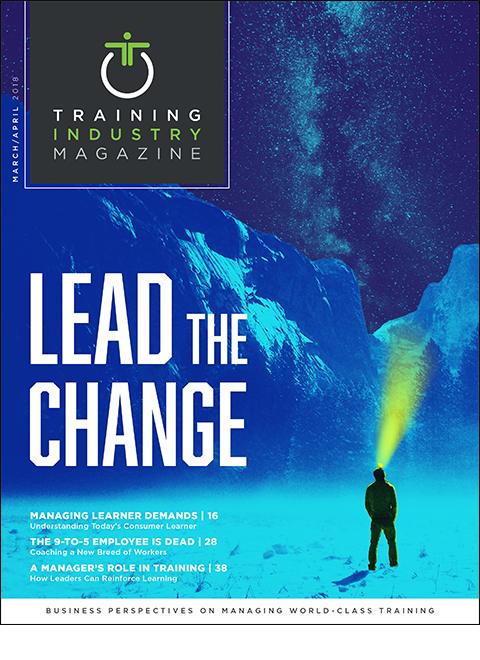 While the value chain is central to discovering precise operational learning opportunities, this is only part of the learning value story. The value chain processes always align with the mission statement. Focusing on the mission and aligning with the value chain will position L&D as a trusted business partner. Revisit your organization’s mission statement. Identify the primary elements within it, defining why the organization exists. Then ask, “How does learning contribute to achieving this objective and the processes identified?” This will lead you to the business activities to focus your learning efforts. Within these activities, identify the value chain processes to target your interventions. Finally, be proactive and meet with the respective operational leaders to identify their performance expectations. These expectations are defined explicitly with the performance management framework. Through defined performance objectives and key performance indicators (KPIs), business leaders focus their efforts, and the efforts of employees, on value chain activities that create the most value. Eventually, it allows learning to address relevant employee needs by aligning with management’s performance expectations. What Exactly is Learning’s Relationship With Performance? Performance management frameworks provide leaders with a tangible and real-time scorecard, allowing them to adapt internal processes to meet changing market conditions and customer expectations. Every performance framework generically derives four key business areas from the value chain. Leaders refer to these areas as perspectives focusing on financial requirements, customer expectations, internal processes, and learning and growth. Drs. Robert Kaplan and David Norton, co-founders of the balanced scorecard and strategy map, introduced the concept of “learning.” These foundational performance frameworks describe learning as an essential enabling perspective providing primary activities to deliver a sustainable competitive advantage. Figure 2 illustrates learning and growth’s relevance and relationship within a performance management framework. Just like the value chain, interdependence is central to every performance framework. Leaders at all operational levels are held accountable to specific, relevant and connected performance metrics. Business leaders expect to see correlations among performance expectations. When done properly, they can trace or map performance relationships from the front-facing operational need to the ultimate performance objective: achieving the mission. Targeted learning opportunities lie within these performance interdependencies. 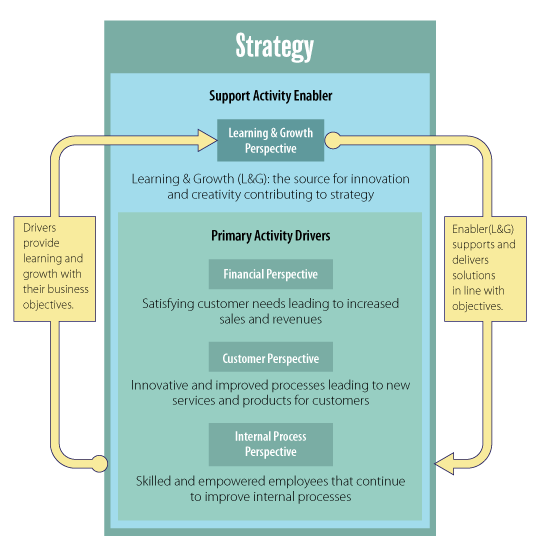 Leaders apply strategy mapping as an extension of the performance framework’s four perspectives. Mapping illustrates cause-and-effect relationships among primary activities. The strategy map design, and subsequently the performance framework, shows clear interrelationships among the internal processes and the intangible assets to derive value, ultimately creating a sustainable competitive advantage. The following example demonstrates the process. Assume ABC, Inc.’s strategic objective is to increase revenue. This requires an increase in sales and production (these define financial KPIs). Achieving these financial KPIs requires deriving related customer performance objectives. In this example, we assume increasing sales and revenue requires developing loyal customers and repeat purchases. The customer KPIs will require specific internal processes to meet the customer interactions such as developing new products and making client interactions simpler. Even though this is a simple example, strategy and performance mapping is never meant to be cumbersome. It should emphasize and focus upon the interrelationships among the three primary operational perspectives driving strategy. The learning and growth perspective supports and enables the three primary perspectives. In this example, learning professionals must identify opportunities to add value within the value chain process. Collaborating closely and measuring the improvement using the relevant operational KPIs within these business activities, learning professionals focus their learning efforts on the specific business needs such as sales, customer service and product development. Learning professionals must be able to demonstrate how training can deliver tangible value to business leaders. To do this, first determine your organizations’ strategic objectives using the mission as a guide. Second, identify primary value chain activities adding value and that correspond to strategic expectations. Third, utilizing an existing performance framework, analyze the value chain business activities for targeted learning opportunities. Finally, strategically map the learning opportunities to the primary activities demonstrating measurable improvements with existing KPIs. Ultimately, learning professionals must position workplace learning as an enabling, value-creating operational business partner. Develop relationships with value chain operational leaders and focus on performance results instead of learning outcomes. Start now to develop tangible performance solutions that resolve value-driven business concerns and contribute directly to strategic value creation. Ajay M. Pangarkar and Teresa Kirkwood are co-founders of CentralKnowledge.com and LearningSourceonline.com. They are award-winning performance management strategists, authors of three books, and course authors for LinkedIn Learning.